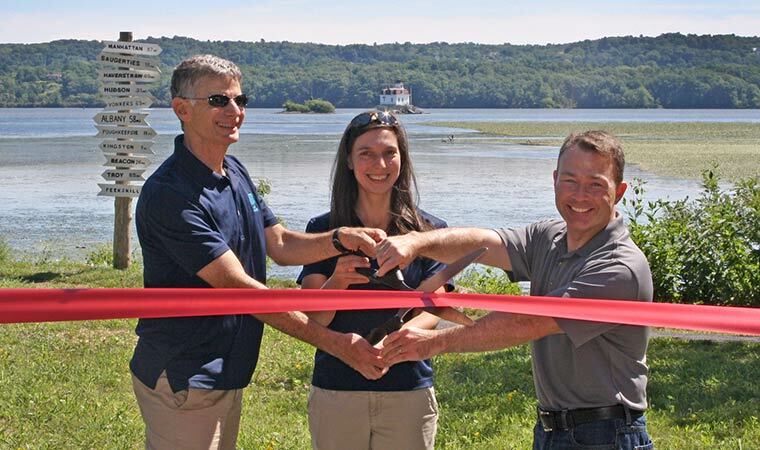 Scenic Hudson Land Trust Executive Director Steve Rosenberg, Scenic Hudson Park Planner Heather Blaikie and Town of Esopus Supervisor Kyle Barnett cut the ribbon to celebrate the opening of a dramatically improved Esopus Meadows Preserve. See this slideshow for additional photos. ESOPUS—Completing upgrades that began last December, Scenic Hudson today opened to the public a revamped Esopus Meadows Preserve with improvements that make the park more accessible and enjoyable for all visitors. Project funders, partners, Scenic Hudson supporters and park users eager to reconnect with their beloved park attended opening festivities. The popular Hudson Riverfront park boasts 96 acres on River Road in Esopus, and it provides great views of the Esopus Lighthouse and Mills Mansion. The upgrades include a multiuse 25-foot-by-32-foot pavilion that will be available to the public during park hours. The pavilion also will be available for educational groups, small events and picnicking. The structure is designed to be flood-resilient and to be able to weather storm surges and sea level rise. A ramp makes the pavilion accessible to everyone and is compliant with the Americans with Disabilities Act (ADA). Scenic Hudson also improved the network of paths at the park to make them ADA-compliant from the parking area to the pavilion. Trail connections between Esopus Meadows Preserve and the Town of Esopus’ Lighthouse Park were enhanced—including a new footbridge—to provide a seamless experience for people visiting the two shoreline parks. Landscape improvements included the planting of native trees. Design and planning of the park improvements were done by Scenic Hudson Park Planner Heather Blaikie. Scenic Hudson invested $213,000 in the park improvements. In addition, the project received a $175,000 grant from the state’s Environmental Protection Fund that was administered by the New York State Office of Parks, Recreation and Historic Preservation. Scenic Hudson and the Hudson River Sloop Clearwater, which offers an environmental education program at the park, partnered on the state grant application. The Hudson River Foundation, through the Hudson River Improvement Fund, provided a $5,000 grant for the footbridge and an educational panel about sea level rise. Barry Price Architecture of Woodstock donated more than half of the fees for designing the multiuse pavilion. Services and materials were donated by Stinemire Engineering of Kingston, Transitional Builders, Inc. of Poughkeepsie and Ulster County Iron Works of New Paltz. A public bid process led to awarding the job to Transitional Builders, Inc. The park contributes to the local economy. Parks, recreational areas and historic sites are engines of the Hudson Valley’s $5-billion tourism economy that employs 83,000 people. In Ulster County alone, tourism generates $513 million in spending annually that sustains nearly 8,600 jobs. Parks also contribute to the region’s iconic scenic beauty and excellent quality of life, prime attractions for maintaining and expanding businesses as well as selling new businesses on relocating here. “Scenic Hudson’s Esopus Meadows Preserve and the adjoining town-operated Lighthouse Park are popular draws for residents and visitors alike. The new improvements at Esopus Meadows Preserve and the improved connection to Lighthouse Park are an attractive amenity for Esopus residents and will further burnish the reputation of Esopus as an outdoor recreation destination for visitors,” said Town of Esopus Supervisor Kyle Barnett. Hudson River Sloop Clearwater runs its Tideline Programs, shore-side educational activities, from Scenic Hudson’s Esopus Meadows Preserve. For information about this program, contact the program’s director, Eli Schloss, at eli@clearwater.org or 845 265 8080, ext. 7106. Those who wish to explore other Scenic Hudson parks nearby to Esopus Meadows Preserve are urged to visit www.scenichudson.org/parks for detailed information including driving directions to the parks. Scenic Hudson works to protect and restore the Hudson River and its majestic landscape as an irreplaceable national treasure and a vital resource for residents and visitors. A crusader for the valley since 1963, we are credited with saving fabled Storm King Mountain from a destructive industrial project and launching the modern grass-roots environmental movement. Today with more than 25,000 ardent supporters, we are the largest environmental group focused on the Hudson River Valley. Our team of experts combines land acquisition, support for agriculture, citizen-based advocacy and sophisticated planning tools to create environmentally healthy communities, champion smart economic growth, open up riverfronts to the public and preserve the valley’s inspiring beauty and natural resources. To date Scenic Hudson has created or enhanced more than 65 parks, preserves and historic sites up and down the Hudson River and conserved more than 35,000 acres.